President Donald Trump during a briefing with senior military leaders in the Cabinet Room of the White House, Washington, Oct. 5, 2017 (AP photo by Pablo Martinez Monsivais). 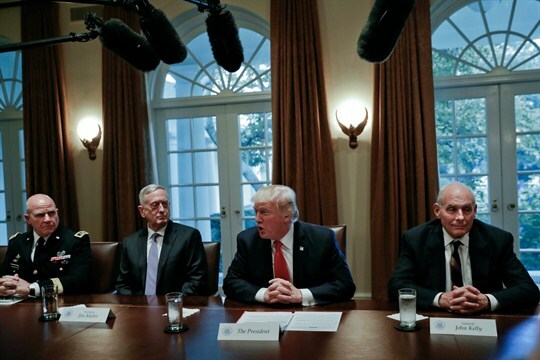 Much was made in the early days of Donald Trump’s presidency of “Trump’s generals,” the retired and active flag officers who made up his Cabinet and White House staff. Retired generals James Mattis and John Kelly, acting as defense secretary and then-homeland security chief respectively, and active-duty Lt. Gen. H.R. McMaster, Trump’s national security adviser, were seen as experienced national security hands who would, it was hoped, create a buffer between America’s vital interests and a new president who wasn’t just inexperienced but often reckless and incendiary.